Water Rat number 651, initiated 1967. One of that esteemed breed of entertainers who emerged from the World War 2 period, Bill Martin's show business career took many paths. He was a survivor who used his myriad talents to the full. Slightly too young to serve in the war, Bill found himself doing National Service in the RAF just after hostilities ceased in 1945. From there he formed a close harmony/instrumental trio, The Martin Brothers, with his elder brother George (later to become King Rat 1971) and brother-in-law Bob McGowan for a season at the Windmill, then on to tours of Scotland and Germany. When the act broke up, he carried on in variety as Bill Vinden "The Guitar Playing Comedian", using his mother's maiden name so that there was no confusion with George, who became successful as "The Casual Comedian". As variety waned, Bill ran a pub for a while, his first marriage broke up and he joined the entertainments team at Butlin's Holiday Camps. He became entertainments manager of several camps over the next decade, eventually reaching the top position of area manager. Always prominently involved in the shows, during this period he worked in a double act with Irish comic Dave Allen, the beginning of a lifetime friendship. Using his many contacts, Bill then ran an agency, part owned a members club and fronted a resident quartet (he was a fine piano player with an outstanding repertoire) at the Hawley Hotel in Hampshire. He also became the full time administrator for The Grand Order of Water Rats (when it was based at the Eccentric Club), served as a Grand Councillor and filled the office of Scribe Rat for several terms. From the early 1970's he found a niche which was his particular forte, performing "warm ups" for television shows. He perfected the required balanced style for his work and was soon in demand by every channel, generally regarded by producers as the "King of the Warm Up Men". In addition, he was cast in several cameo roles in situation comedies such as "Are you Being Served?" and "Yus My Dear", and wrote the scripts for impressionist (and Water Rat) Paul Squire's TV shows. In the early 1990's having tragically lost his eldest daughter Laura to cancer, Bill retired to Spain until, in 2005, the death of his wife Sybil, and his own advancing ill health, brought him back to England. He became a very popular resident at the entertainers' retirement home Brinsworth House, playing piano for the residents and swapping stories with old friends. His daughters Andrea and Freya supported and visited him constantly. 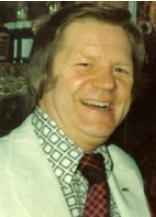 There was also a son from Bill's first marriage; Trevor Seymour-Jones. To me, he will always be my Uncle Bill, God bless him.